This is the larger door/widow version of the original ST1 model. (while the stove dimensions and specification are the same, the larger window gives the best view of the fire). The result of thousands of hours of development, the ST1 Vision is one of the most efficient and clean-burning stoves available today. Designed with simple, easy to operate user friendly controls. Constructed using a triple-layer convection system, there is a precision engineered welded outer and inner steel body with thermo-refractory fire brick inner linings. Designed with a large viewing window for amazing views of the fire. The flame pattern with the advanced "after-burner" system is quite unique. The ST1 Vision is a dedicated wood-burner only - if you need a multi-fuel stove to also burn coal please see our other models or the ST2 stove which shares the same advanced technology but with a multi-fuel grate included. Finished in black high temperature paint which we source from the USA and with thermo-ceramic clear glass from the industry-leading "Schott" brand in Germany. The air-wash clean glass system is particularly impressive. The ST1 Vision has a 5"(125mm) diameter top flue outlet (there is no rear flue exit). Can be used with 5" diameter flue liner or twinwall flue. 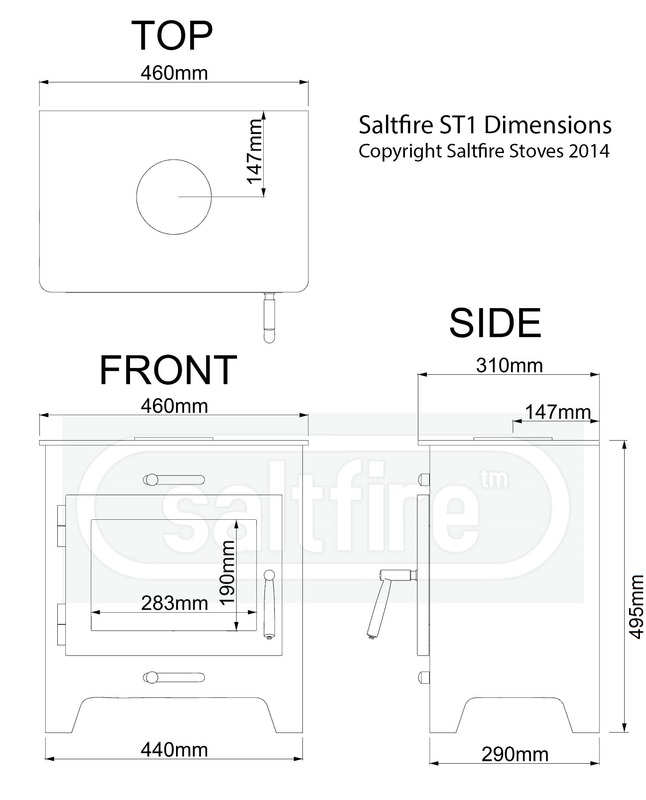 Click the button below to add the Saltfire ST1 Vision Woodburning Stove to your wish list.